Been trying to figure out a engine miss in my 4.9 1992 F150 and research has shown me that the ECM has a known issue with caps going bad, so I pulled the ECM out to see if I could find any cap damage and it looks like the prior owner (s) have changed the ECM already at some point as indicateed by the REMFG sticker. But on the back side of the PCB I noticed a wire jumped / soldered onto the back of the board. Im thinking that maybe whoever "Reman'd" this ECM put that jumper wire because something was wrong, like maybe a cracked trace in the PCB or something? Anyone have some insight as to why it is there? Thanks for your time. 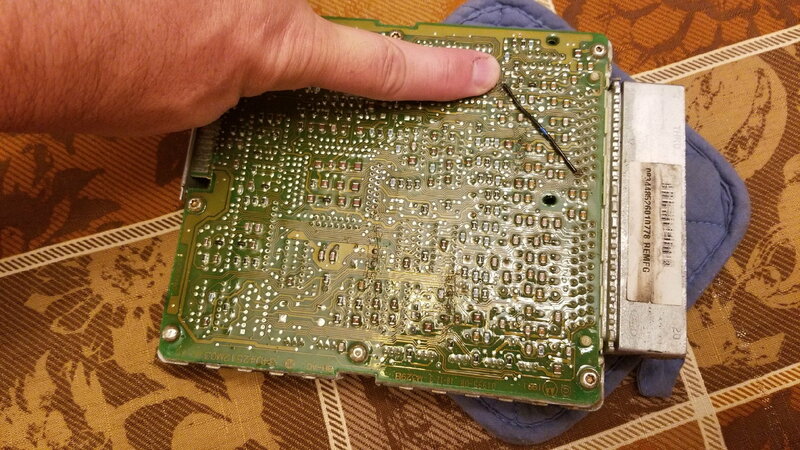 Im thinking that maybe whoever "Reman'd" this ECM put that jumper wire because something was wrong, like maybe a cracked trace in the PCB or something? That seems like a good guess. My truck was violently bucking, I inspected my ECM to find a leaky capacitor. I replaced it with a rockauto remauf and bucking went away. Good luck with your troubleshooting, wish I could have provided better info, but I think your guess is plausible. I bought a new computer but it wasnt my problem. I fought with this truck for about a week. Had spark, had fuel ( changed fuel pump, plugs, etc) and would not run. If I held the throttle at WOT and sprayed starting fluid it would pop off sometimes. I pulled the plugs out, they were coated black (fouled) and i clean them. Truck cranked and ran bad for a few minutes then died out and would not crank again. Pulled plugs out and solid black again. Cleaned plugs again, same thing. Truck would start and run a few minutes and die and foul the plugs. Ran the check engine light codes. It showed the ECT sensor was bad (the one on the front with 2 wires). I changed the sensor, and put clean plugs in the truck and it started right up and runs like a well oiled machine. What I think happened is, the engine was shooting max fuel into the engine thinking it was ice cold outside (it was 80 degrees F here at the time) and it would cause the plugs to foul out almost immediatley causing me to pull my hair out trying to diagnose the problem. So yah, a simple ECT sensor can keep your truck from starting properly. I had no clue that spark plugs could foul so quickly and stop them from sparking but better believe they can. Thanks very much for updating this thread. Forums seem to be full of threads where someone posts a problem, followed by discussion, but never follow back up to report what the solution was. So, this was helpful to read. Glad you got it fixed.